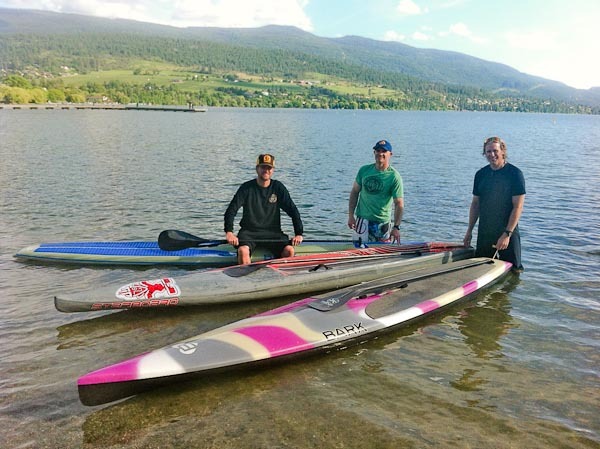 The plan slowly morphed, and eventually Duff settled on attempting to paddle 100km in a single day, on Lake Kalimakha (near Vernon, B.C.) The paddle would be a fundraiser in support of the Stephen Lewis Foundation’s Dare Campaign, combatting AIDS in subsaharan Africa. Having never even stood on a SUP (Stand Up Paddleboard) before – I had my work cut out for me. After ordering an inflatable board (these are total game changers, allowing for the easy transport of these traditionally long and awkward watercraft) I began racking up the miles. Day one; six kilometres left me gassed. But day after day, week after week, I went back to my local lake. 10km. 20 km. 30 km. 50km. A week before the event, I completed my last long paddle: an 80-kilometer 12-hour day – and felt ready. We set off at 4 am, just as the first light warmed the eastern sky. Hour after hour we plugged away, focussed on maintaining an efficient hull-speed of approximately 6.6 kph. It was almost 10pm — after 18 hours of paddling — that we finally landed, 100km behind us. You can learn more about Duff’s astounding fundraising efforts here. Finally, I wrote a Huffington Post story about the event – and how the simple challenge brought happiness and focus to my days.